This topic contains 12 replies, has 2 voices, and was last updated by Anneg 7 years, 1 month ago. Hi Anne please answer these questions and do not veer off the subject. 1. What have you sold more than once and which Page was this from? (product|exact url)2. What is your most popular posts overall and why? (did you promote them or are they SEO)3. What monetization have you got on the popular pages? 3. How many guest posts have you done in total? Please list the url of the guest posts and the url you pointed to.4. Do you build links? Where and How? (Blog commenting does not count)This is a lot of work but I need to know these things as this is not my business. I need this so I can work out what content you should be writing and how to get people there. 1. I've only ever sold things from a collection of adsense clicks. Unfortunately, I don't know which pages these sales originate from. 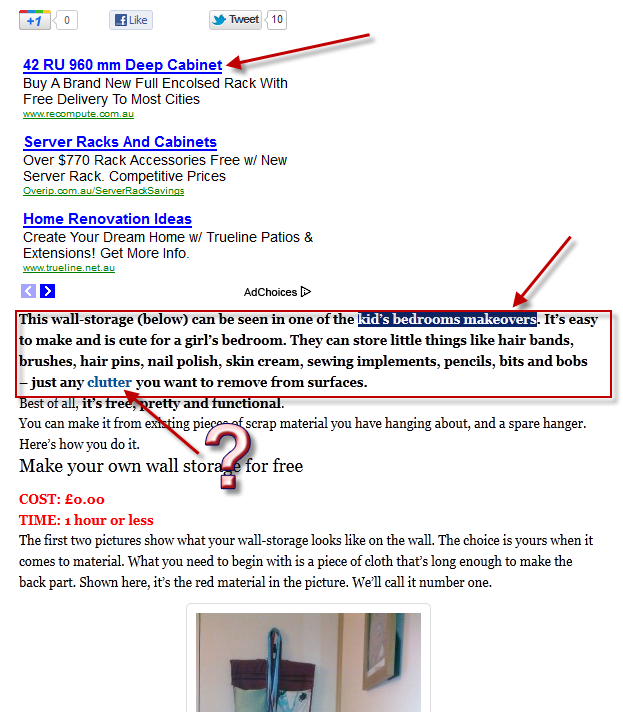 ok thanksI need to make you understand a few things before we make a plan so you can make it a success.Firstly we will look at how you have done all this promotion.I went to http://comluv.com/affordable-storage-ideas-for-small-bedroom/ and it is a great guest post but I can see problems here...1. The article is about DIY projects but you do not have this in the authors bio as anchor text. You have "build confidence". This is not a match. 2. I see the link to DIY below but that's not what I see first.3. In the article you say "I have a tutorial on how to do this on my diy blog if you want more information" and link the word tutorial to this post http://ourdiyprojects.net/make-your-own-wall-storage/. I had no idea what I was clicking on.. The link text should tell me. It should read "You can easily make your own wall storage like the one pictured and save money." Making "make your own wall storage" a link. 4. Later in the article you have linked to the same article but with different anchor text. This is useless because Bots see the first link on the page only. So they would be taking notice of the anchor text "tutorial". 5. If you are allowed to have two links they should be going to two different pages with clear anchor text so the visitor knows what they are going to see. So this article should have had a link to the wall hanging project and the storage behind the curtain project. These are some things that will make more people follow through and is better for SEO.Now the landing page where the guest post pointed to (http://ourdiyprojects.net/make-your-own-wall-storage/)1. The text does not look neat and uniform. You have bold areas and also uneven spaces. This is very important as it screams newbie straight away without even reading the content. 2. Adsense is not blended in nicely at all. I think you have two different style texts here, one for Adsense and one for your article text. 3. The text size should be increased by at least two points. So if it is set to 10 it needs to be 12, or if it is 12 it needs to be 14.4. There are major problems with your links. You have a link like this kidâ€™s bedrooms makeovers. (the letter s is not linked) Then you have the word "clutter" linked to a book on Amazon called "clutter busting" Again I had no idea what the link was for. To need you to fix this article. Yes it will be a lot of work but it is important you know these basics. It is still worth fixing as content like this is an asset.1. Do everything I said above including fixing the text and the links. 2. Put a picture of a wall hanger from Amazon (aff linked of course) using it as another example of what you could do. Here is one. Explain how you could make this one yourself or simply buy it off Amazon if you are too busy.3. If you would like to add a link to the clutter buster book then make it clear. Put a heading saying further reading or more space saving ideas. 4. You also need more headings. If you want to know how then study some of my articles on my site. The reason we are doing this is because you need to be able to sell something when you get people there. You can bring as many people as you like to your website but if they are turned off then it is no use. When you have fixed this as much as you can let me know. Do not stress on the things you cannot do. Just let me know and I will help. Thanks, Mitz. I'll set about editing this later today.This is not an excuse, just an explanation: The newer articles on this site are much better. This one was written in Blogger before the site was migrated. I had to go through 41 articles to edit pictures, text etc, because nothing came through the way it was originally spaced and written. In the html, this article has been spaced properly, but on the page, nothing different happens. I'll try the spacing again. I don't think I'd be able to do the text size, but I'll try. The bold area: I was following what you said in a tutorial about having one bold area at the top, and one italics area at the bottom - both with your key phrases.Thanks so much for this. I'll do my writing/posting then tend to this when the kids go to bed. I don't mind the work. Best. Thanks for your time, Mitz.I've now addressed all the points you raised.1. I've edited my comluv bio to say what you suggested.2-4. I've only found this out, but when I tried to edit the post, I realised I'm not allowed to edit anything on that site. I was tempted to delete and resubmit it (because that article has only been published on the 'blog' page and not on the site proper) but I changed my mind last minute because I don't think Andy would allow me to do this. Nevertheless, I've learned from the lesson. The landing page1. The text is a big problem. On the 'edit' page I've actually inserted about 5 returns above the H1 heading. This isn't showing up on the post. The only thing I could think of, is maybe the Blogger format did not properly convert. I've looked at the html version, but can find no extra line breaks there. 2. I've set up the adsense unit to show up on the right of the posts. However, I did this after the migration, so all the posts which came with blogger look like this. If you look at the newer ones you'll see what they've looked like since. I'm afraid I don't know where to start when it comes to changing the font in WP. The editor section is something I'm learning slowly. I'd love your help with the text size if you can. I know you may not be able to do anything about the Blogger-Wordpress mismatch. I totally understand about the move but this is just a quick lesson on how it should be.. Soon you will be able to see so many things from just landing on a page. Please send me your wordpress login details and I will check the HTML of the post. Once we fix a few things on this site and tweak the content...then we can get people to visit. Hi Mitz, just a quick message to let you know that this morning I got a message saying my adsense account has been banned. This is just in case you go on the site and are looking for the adsense units. They're no longer there. I don't know why I was banned. I suspect some spamming site has got hold of my blog or something, because I certainly haven't done anything untoward. Hmm I guess this can happen to anyone. There could be any number of reasons. Did you contact them to see why? Yes. But they've already said they won't say why. 'Posing a risk of generating invalid activity' is the closest they came. It's a form letter, though. They say that to everyone to cover themselves. I have appealed. I'll see what happens next. Apparently, sometimes spam bots can access your pages. I guess this happened to one of my blogs, so all the other accounts are held suspect. There's not much you can do but appeal and wait. I'm trying to be positive about it and hope that they'll realise I did nothing wrong. ok I went in to your blog but I have been updating it first… There was 12 updates to do.. I also backed it up first just in case…You will need to add your commentluv username into the settings to make commentluv work again... Now I am going to check on the post you did. Ok I have fixed some things.. There was a problem with obsolete html code making the post crazy! I dare say the posts were transferred over bringing the junk with them. Also I see that you have Platinum SEO and a sitemap plugin when there is already Yoast installed which does all this anyway? Do you want me to take them out? The double up on these SEO plugins and the bad HTML will cause problems for you and does not produce a clean website. These kind of things can ruin your chances of ranking. I've just come by to say thanks for your support and the work you've done on the site. While you were there, were you able to determine if I'm allowed to put some of the widgets in the footer? I've been reading up on it, but so far nothing I've read seem to apply.